Baltic Express train, Buy Baltic Express train tickets online quickly and easily. 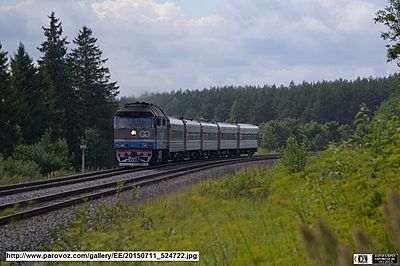 The passenger train 34 travels on Tallinn - St. Petersburg - Moscow since July 19th, 2015. It is managed by Russian Railways and it runs every day. The train covers 964 km in 14-16 hours most of which are at night. The following classes are available on the train: 2nd class, 3rd lass and Seats. 2nd class is a 4-berth compartment with two upper and two lower berths. 3rd class is an open car with 54 sleeeping berths. There is also a carriage with seats. The train doesn't have a restaurant car.